This post is sponsored by Nuts.com. All thoughts and opinions are, as always, 100% my own. 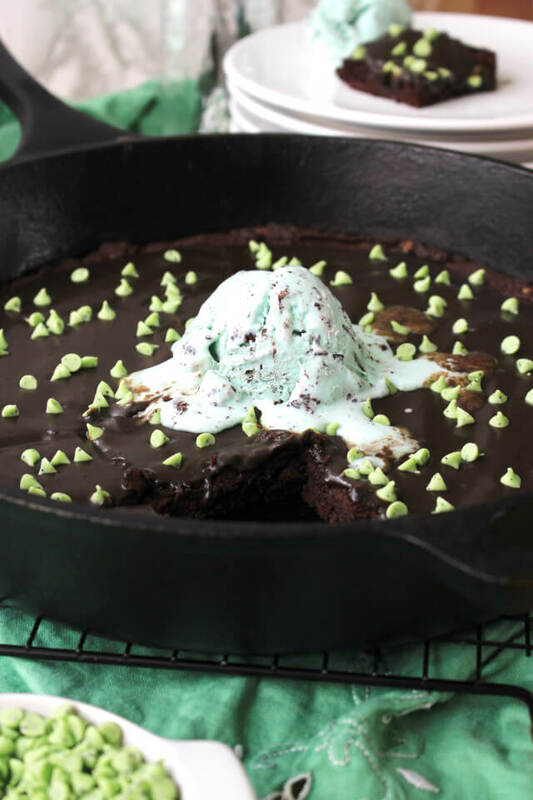 These dense and fudgy Mint Chocolate Chip Skillet Brownies are egg free, naturally sweetened, and made with gluten free chestnut flour! This is an unconventional brownie recipe. 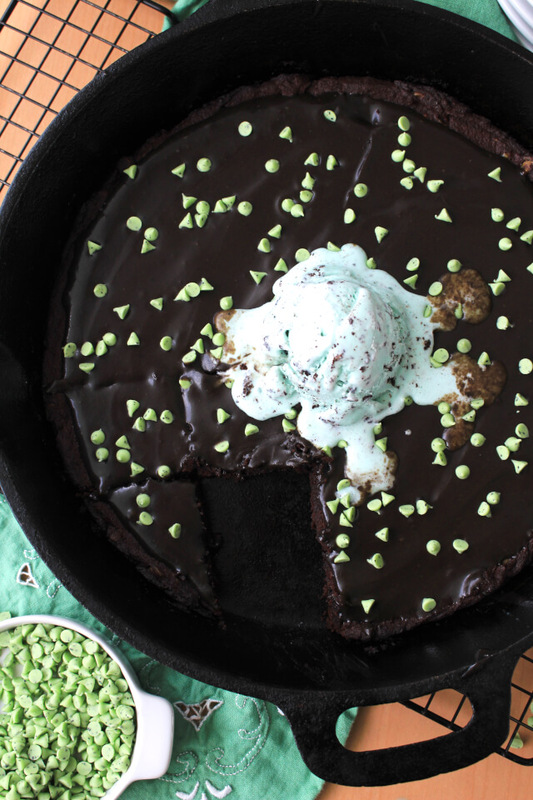 Sweet, fudgy, dense, and delicious, but totally unconventional nonetheless. Do you ever shy away from a recipe because it's not made the way you've always thought it should be? C'mon, be honest. No judgment zone right here. I will admit that there was a time when I would have taken just one look at the ingredients for this recipe and I would have gone running for the hills. I mean, brownies made with no sugar? And chestnut flour? What the heck is that all about, right? I'll tell you what that's all about. It's about being willing to think outside of the box and being willing to go for the old switch-a-roo by swapping what you think should be in brownies for better-for-you ingredients. Some of you are already making little changes here and there. There are so many people out there these days that are looking for adaptations of their favorite sinful treats to cater to gluten free lifestyles or low sugar ways of eating. 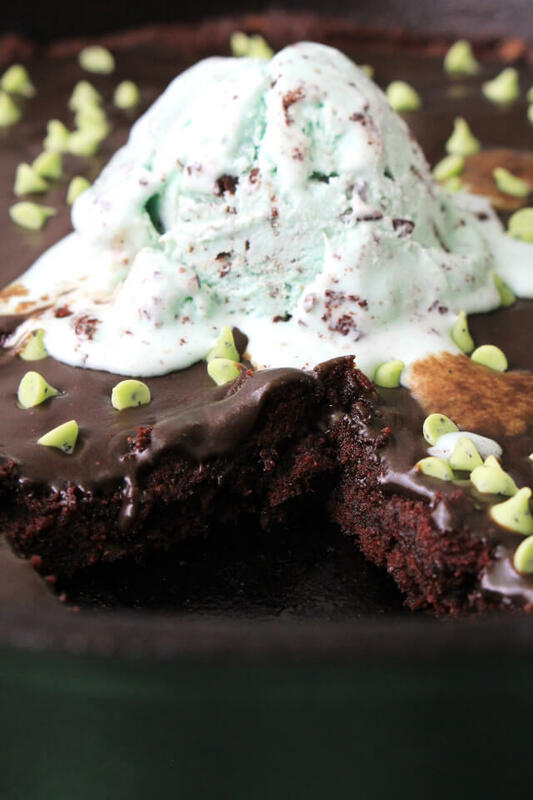 I myself have been experimenting more and more lately with healthifying recipes and I loooove when I come up with a winner...like these amazing Mint Chocolate Chip Skillet Brownies! I was inspired to make this twist on the classic brownie when I was invited to participate in the uber fun Pantry in a Box Challenge hosted by my new friends at Nuts.com. Sounds fun, right? It SO is! Which brings me to the Pantry in a Box Challenge! The Nuts.com folks sent me a box filled with all kinds of pantry goodies with the challenge to create a fabulous recipe using only the products in my pantry kit as pantry ingredients. Fruit, vegetables, meats, and dairy were allowed, but my pantry was limited to only what they sent in my box. When I opened my box, it was filled with so many amazing products like Organic Orzo, Saffron Jasmine Rice, Tomato Powder, Raw Spanish Peanuts, Black Garlic, and Dried Wood Ear Mushrooms. My head was spinning with recipe ideas with each and every product I pulled out of the box. Then came the Dutch Cocoa Powder. Now, I'm not normally a sweets gal, but that rich cocoa powder was speaking to me. When I pulled the bag of mini Mint Chocolate Chips out of the box, I knew in that instant that I wanted to go sweet. Not my typical savory M.O., but I was up for the challenge. When inspiration strikes, you should run with it! I was most definitely challenged to think outside of the box with these babies. My Pantry in a Box was equipped with chestnut flour which could take the place of the traditional white flour, but I soon realized my box did not come with any sugar. How was I going to make brownies sweet with no sugar? Sugarless brownies would be a no-go. I almost scrapped my idea when I remembered that I could use fruit as per the challenge instructions. I could sweeten my brownies naturally! Would it work? Honestly, I was a bit skeptical, but damn it, I was determined to use that Dutch Cocoa Powder and those Mint Chocolate Chips, so I was going to make it work. Dates and bananas took the place of sugar and eggs and, lo and behold, my Pantry in a Box brownies were rich, dense, fudgy, and every bit as delicious as their classic counterpart. Whether you are looking for a recipe to suit your health, your diet restrictions, or you are just into getting creative in the kitchen, you must try these think-outside-the-box Pantry in a Box brownies. They are inspired! 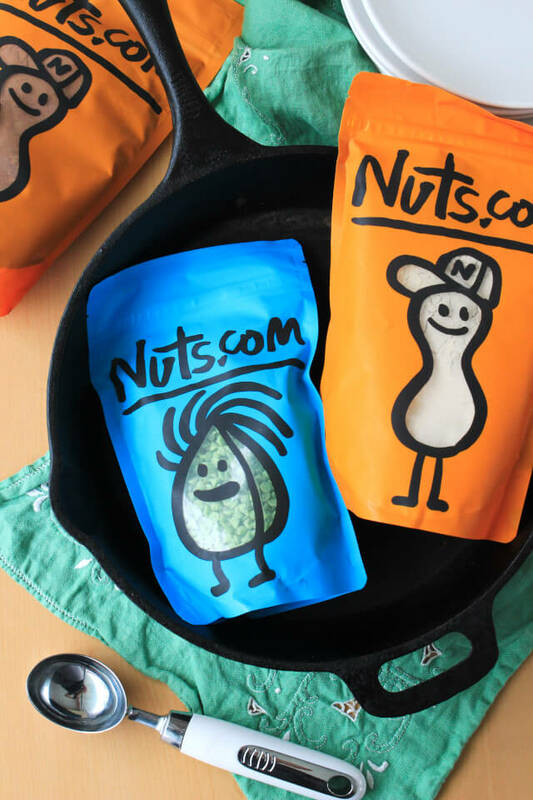 A don't forget to head on over to Nuts.com and see what inspires you! I promise, you won't be disappointed. Tell them Becky from The Two Bite Club sent you! 2. Mix together the chestnut flour, cocoa powder, baking powder, and salt. Set aside. 3. Soak the dates in hot water for 10 minutes. Drain and process the dates with the mashed banana in your food processor or blender until smooth, stopping to scrape down the sides as necessary. Transfer to your stand mixer bowl. 4. Add the melted butter and vanilla extract to the mixing bowl and mix until combined. With the mixer running, add the dry ingredients to the mixing bowl a little at a time until incorporated. 5. Melt 1/2 cup of the mint chocolate chips in the microwave until just melted. Mix the melted chocolate chips into the brownie batter. 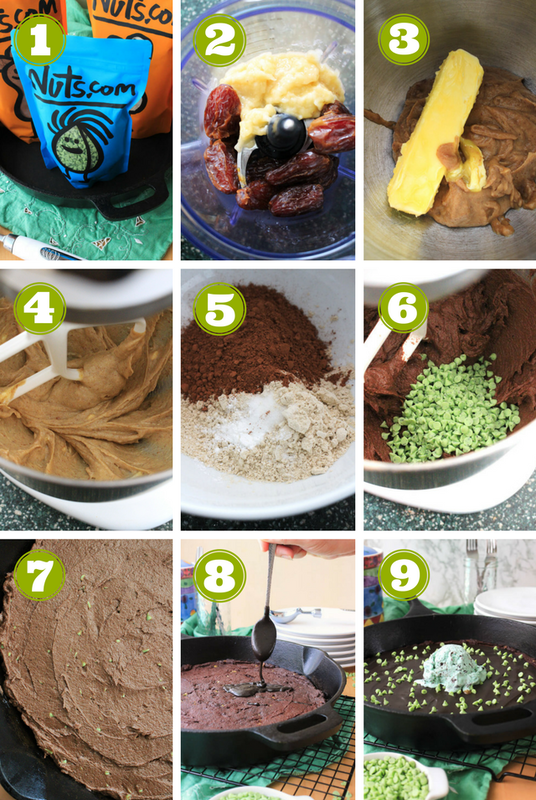 Mix the remaining 1/2 cup of mint chocolate chips into the batter. 6. 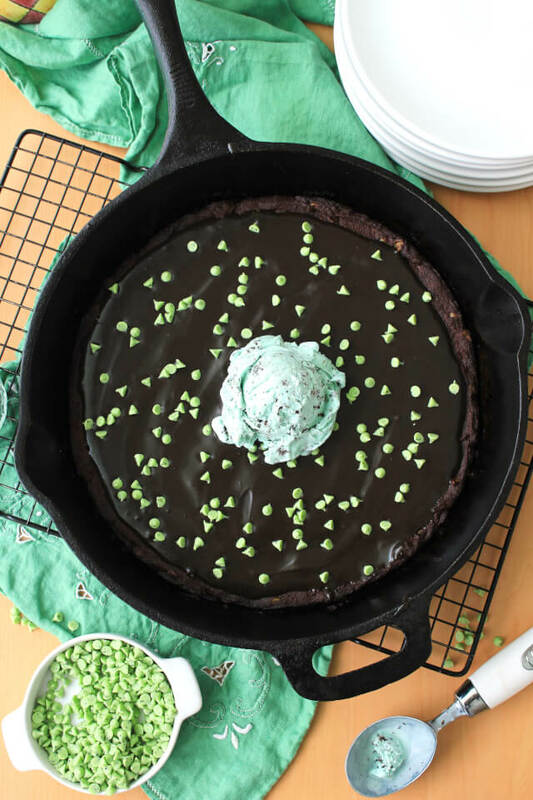 Spread the batter into a greased cast iron skillet. Bake in the preheated oven for 30 minutes. Remove from the oven and cool in the pan on a wire rack for at least 40 minutes. 7. Meanwhile, heat the milk and butter in a small saucepan over medium low heat until the butter is just melted. Add the chocolate chips to the pan and stir continuously until just melted. Stir in the Dutch cocoa powder. Set aside until the brownies have finished cooling. When brownies have cooled, top with the ganache and cut into 16-18 pieces.